Do you often sit down to work in your journal but you have no idea where to start? If this sounds like you then you don't want to miss the tutorial that I have here on the blog today! 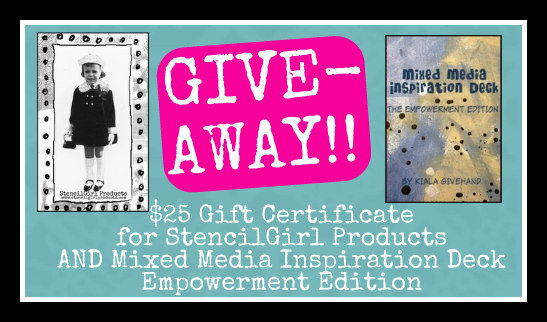 I received some of the Mixed Media Inspiration Deck from Kiala Givehand through the Stencilgirl Creative Team this year and I have to say that I had a lot of fun playing with them! I don't know about you but often I sit down to create something but maybe I don't know where to start. Sometimes there are just too many things to choose from and it can be all a little overwhelming. These cards are the perfect way to solve this. Just pick out one and you're off and running. I worked with the Loopy Ladders stencil today to add some extra dimension and interest to my background in my altered book.